1/ Add a dash of olive oil to a pan and cook the tomatoes about 10 minutes. 2/ Add the wine and reduce. Add the olives, garlic, Espelette pepper and capers. Simmer this mixture over low heat for 10 minutes. 3/ Remove the pan from the heat and add the basil, lemon zest and salt. 4/ Salt and pepper the salmon fillets. Program the application to the “Fish” setting and insert the meat°it probe into the thickest part of a salmon fillet. 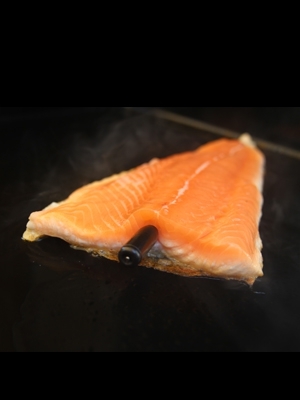 5/ Put the salmon directly on the barbecue grill or in a pan and cook on one side only. 6/ When the app sounds the end of cooking time, place the salmon fillets on plates, add lemon juice to each piece, along with the prepared sauce. 7/ Add extra minced fresh basil and serve immediately.